There was a time somewhere around the early 1980′s when the technology that was used for making ice creams and ice lollies must have suddenly seen an improvement, as the market started to see a number of new styles of frozen sweets appear. Prior to this most ice lollies were just frozen juice on a stick, with a roughly rectangular shape. Of course there were exceptions, such as Rocket Lollies or Strawberry Mivvis, but that was about it. 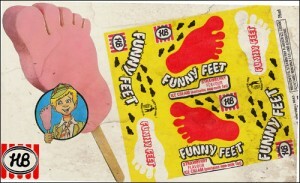 One of the first of the new breed of ice creams to appear was Walls Funny Feet. This was a lump of pink coloured, strawberry flavoured ice cream on a stick, moulded into the shape of a comical looking foot with a slightly oversized big toe, if I remember correctly. Over the years some changes were made to the design, including making them out of a rippled flavour of ice cream, but I don’t think they are available any more. The problem with Funny Feet was that the ice cream they were made of had a habit of melting fairly quickly, and becoming a little too soft. This meant the entire thing would start to bend when you put it in your mouth, and lumps could drop off very easily. 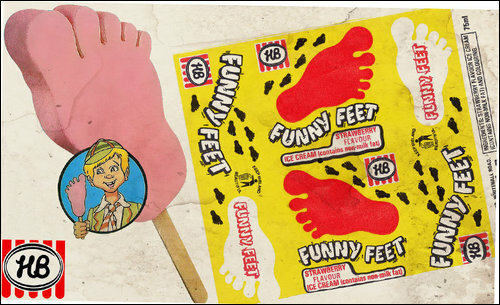 I remember my sister was a big fan of Funny Feet but she didn’t eat them very fast, so quite often you’d see here with pink trails of melted ice cream running down the back of her hand.